Last week a low resolution advanced peek at the new Sookie Stackhouse cover for Dead in the Family was released in the Project Paranormal video. Charlaine Harris has now posted a very nice version on her website. Unfortunately we still have to wait until May 4, 2010 for the release. Don't know about you, but the Trueblood sticker on the cover bugs me - marrs the design in my opinion. 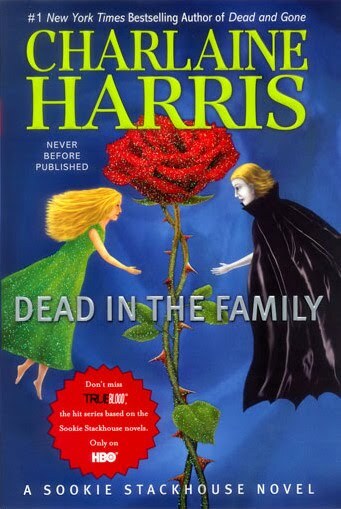 Also Charlaine Harris has posted a PDF of Chapter 1 on her website. I wish that the red "True Blood" burst was a sticker that could be removed. I know why it is there, to let people know of the connection, but seriously - I have to agree with you. I am a lot more forgiving with that kind of thing on mass markets, but I like my hardcovers to be the "class acts" of my collection. It's a great cover but I hate the True Blood stiker too. It would be okay if it was a removeable sticker but I'm sure it's not. I like the cover. You are right about the True Blood sticker though. Kinda ruins it. Oh! the cover is so pretty! and then that Trueblood sticker has to ruin the overall effect. I agree with u on that. I'm just happy they're staying with the whimsical, glittery, illustrated style for the hardcovers. I HATE the paperback release with the giant rainbow faces. For some reason, those turn me off, big time. I suppose it's because I started the series in hardcover, and I can't wrap my brain around the new designs. Derek I like the way you refer to hard covers as class acts. Couldn't agree more. Patti I would bet it isn't either. The Hollywood ad mention is a very sad thing. Sharon it seems so crass. Bella we are all in agreement. A peelable sticker makes sense. Heck when the book is on my shelf a decade from now and the TV series is a faded memory, it will seem ludicrous. Rebecca some don't like the illustrated design but it is stylish and really establishes the uniqueness of the series for me. The MMPB covers aren't so much designed as packaged. Horrible covers. I wish the red Trueblood thing wasn't there too. I wouldn't even want it as a sticker because that would probably leave a residue. I have always loved these covers. The cartoon-like artwork and the glitter really set these novels apart. I grabbed book #1 on a whim last year because the cover kept drawing my eye. Pretty but I agree, the sticker annoys me too. Now I will try to guess what the cover art means for the story. Love the cover but I hate when they put (non removable) promotional things on there. Her books have very unique art on the covers and I have all them so it kind of ruins the effect when you have a collection. Hopefully by the time it comes out maybe they will change their minds and switch to a sticker. Do you think if enough ppl complain, that they'll take that True Blood thing off? Or at least make it a removable sticker? =) & I like the way Derek refers to hardbacks as class acts, too. How true. And totally trashed with that silly sticker. Sara the sticker was on the last hardcover too and wasn't removable, but they are classy covers despite it. Karen I suspect the True Blood Hollywood guys have their fangs in too deep with the publisher. Drey complaints and petitions have been know to be a powerful thing, but I doubt. This kind of advertising isn't directed at the regular readers like us but the TV watchers that are curious and recognize the show name. How sad.